STUNNING ARCHITECTURAL MASTERPIECE nestled in the lush hillsides of the highly desirable, gated community of Vista Heights Estates. This Grand Mediterranean Villa boasts pure elegance as the foyer greets you with vast open spaces, natural light & lovely double sided staircase with beautiful wood railings. The main living area includes a private downstairs bedroom & full bath, & downstairs office with french doors. The cozy formal living and dining are located next to the Gourmet Kitchen with granite counters, upgraded stainless steel appliances with expansive center island ideal for preparing all your favorite meals. The incredible family room with custom built cabinetry & warm inviting fireplace. 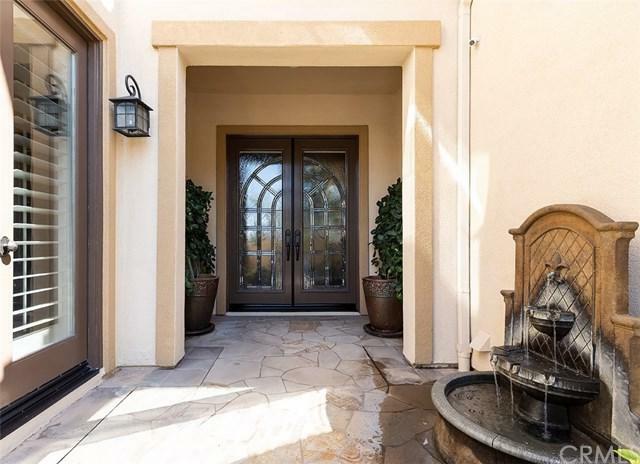 This exquisite home features 5 bedrooms with 5 bathrooms. The expansive master suite includes a private retreat for workouts or office, 2 large custom walk-in closets, dual vanities, large soaking tub and separate shower. The Entertainer+GGs Dream Backyard with a saltwater pool and spa, fire pit area . with seating, luscious landscaping with lime, navel orange & Meyer lemon trees. The custom built covered Outdoor Kitchen is equipped with 2 barbecues, side burner, refrigerator, sink & more to host amazing parties. Located at the end of the cul de sac & very private street you+GGll have plenty of parking for guest plus a 3 car garage with built-ins. "SMART BUYER CERTIFIED HOME!" All inspections, disclosures, reports, including clear title have been completed. Sold by Scott Engle of Realty Source Incorporated.